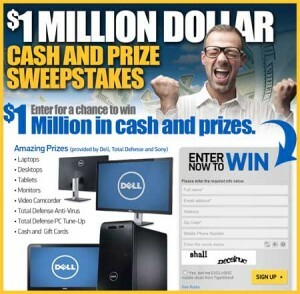 Enter to win your share of the 1 Million sweepstakes in cash and prizes with the Tiger Direct giveaway. You could be the winner of some serious swag with this amazing tech sweepstakes. TigerDirect is a electronic store which is home to all your favorite tech goodies. 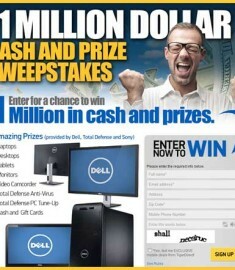 TigerDirect in partnership with Sony, Dell and Total Defense are giving away a bunch of free stuff! I am talking a chance to win Laptops, Desktops, Tablets, Monitors, Video Cameras, total defense anti virus and PC tune up, cash and gift cards! Do not miss out on the tech giveaway and make sure you enter online or in store before the closing date of January 11th, 2014, at 11.59 pm ET. There are a total of Twenty Nine Thousand, Six Hundred and Fourteen (29,614) prizes available. 14 weekly prizes and then one hundred Grand Prize winners! The weekly prize winner will receive the following: One Sony Camcorder (ARV$299.00); One 24” Dell Monitor (ARV: $300.00 each); One Dell Laptop (ARV: $500.00 each); One Dell Desktop (ARV: $500.00 each); or One Dell Tablet (ARV: $300.00 each). The Grand prize winners will receive Fifty Dollars ($50.00) in cash or Fifty Dollars ($50.00) in TigerDirect.com Gift Cards. Seventeen Thousand, Five Hundred (17,500) First Prize winner will receive one copy of Total Defense PC Tune-Up Software (ARV: $39.98 each). Twelve Thousand (12,000) Second Prize winners will receive one 6-month license for Total Defense Anti-Virus Software (ARV: $25.00 each). I love a tech giveaway and Tiger Direct is one of the best places to go shopping for all your tech needs. Who does not love the chance to win free stuff and the 1 Million sweepstakes gives you the chance to get your hands on some sweet tech gadgets!